Neurothekeoma is a type of benign tumor first described by Harkin and Reed in 1969 as nerve sheath myxoma. Later in 1980, Gallager and Helwig published a histological series of similar tumor to describe the relationship of these tumors to Schwann sheath cells of peripheral nerve and coined the term “neurothekeoma.” Other suggested synonyms for neurothekeomas are plexiform myxoma, perineural myxoma, Paccinian neurofibroma, and cutaneous lobular neuromyxoma, but neurothekeoma is the most widely used term to describe these tumors. The condition is usually seen in the first three decades with predilection to female gender and upper part of the body. It is most commonly seen as a cutaneous lesion in the head-and–neck region, but it can be found less often in extracutaneous sites such as hypopharynx and spinal canal. There is a scarcity of available literature reporting intracranial neurothekeomas. To the best of the author's knowledge, till date, only few cases of intracranial neurothekeoma are reported which is mainly located in the posterior fossa and parasellar regions, with this report being the second in world literature describing a case of neurothekeoma in cerebellopontine angle (CPA). A 27-year-old right-handed female presented to us with complaints of right-sided intermittent gradually worsening dull-aching headache, facial numbness involving complete right half of the face, reduced sensation over the right half of the tongue and tendency to chew from the left side, progressive dysphagia for both solids and liquids associated with chocking sensation with every feed, and right-sided progressively worsening hearing loss and left-sided spastic hemiparesis which were first noticed in distal lower limbs and gradually progressed to involve the upper limbs. There was no history of associated seizures, loss of consciousness, and recurrent vomiting. Detailed neurological examinations revealed hypoesthesia in the right V1, V2, and V3 dermatomes with impaired corneal reflex on the right side, minimal impairment in the right eye closure with no obvious facial asymmetry, right-sided sensorineural hearing loss with positive right-sided cerebellar hemispheric signs, upper motor neuron-type right-sided hemiparesis with power grade +4/5, brisk deep tendon reflexes, and extensor plantars in the right side. Sensory examination was normal. Based on the finding, a diagnosis of right CPA syndrome was made. Computed tomography (CT) scan of the brain showed ill-defined hypodense lesion in the right CPA with mass effect over pons and right cerebellar hemisphere [Figure 1]a. Magnetic resonance imaging (MRI) of the brain showed 4.9 cm × 3.7 cm extra-axial mass in the right CPA cistern, hypointense on T1 [Figure 1]b, hyperintense on T2 [Figure 1]c, no restriction on diffusion-weighted imaging [Figure 1]d, no focal area of blooming on gradient sequence [Figure 1]e, diffuse heterogeneous enhancement on postgadolinium T1 sequence [Figure 1]f, and the multilocular lesion insinuating right trigeminal nerve and displacing vertebral and basilar arteries. Based on radiological assessment, a diagnosis of CPA epidermoid with the possibility of Rosette-forming glioneuronal tumor was considered. Under general anesthesia, right retromastoid craniotomy and gross total tumor excision were performed. Intraoperatively, the tumor was very soft, easily succable, and moderately vascular with no obvious attachment from the adjacent nerves, vessels, and brain tissues. Intraoperative squash technique and subsequent routine histopathology showed myxoid spindle cell tumor with adjacent reactive piloid gliosis. 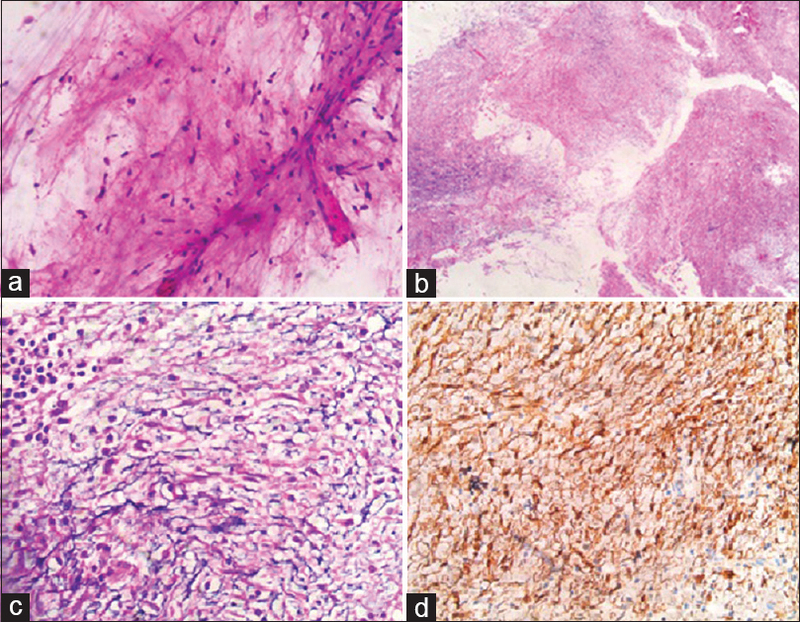 [Figure 2]a The tumor was noncapsulated and multinodular [Figure 2]b showing lobules of hypocellular areas surrounded by condensed fibrous and schwannoid tissue with lymphomononuclear infiltrates. The central hypocellular areas are made up of spindled and stellate cells scattered in abundant myxoid background. [Figure 2]c There was no evidence of Verocay bodies or high-grade features such as mitosis, atypia, or necrosis in the sections studied. Immunohistochemically, the tumor cells were strongly positive for S100 [Figure 2]d and focally for glial fibrillary acidic protein (GFAP) and were negative for epithelial membrane antigen (EMA), cytokeratin, and synaptophysin, and a possible diagnosis of benign nerve sheath myxoma (neurothekeoma) was made. Cutaneous neurothekeomas are well-known diagnostic entity which are usually cured by gross total excision and do not require any adjuvant chemotherapy or radiotherapy. As per cumulative knowledge from reported literature, we believe that the similar intracranial counterpart can be treated well without any chance of recurrence with gross total resection. The differential diagnoses of intracranial myxoid lesions include myxoid neurofibroma, plexiform neurofibroma, myxoid schwannoma, perineuriomas, and myxoid neurothekeoma. Myxoid neurofibromas are well circumscribed and lack lobulated appearance. Histologically, they lack multinodularity and contain interlacing bundles of Schwann cells with wavy bland nuclei, shredded carrot collagen, scattered lymphocytes, histiocytes, and intralesional nerve fibers in a fibrillary background. They show patchy S100 expression unlike our case. Plexiform neurofibromas arise from the proliferation of neurofibroblastic cells and are usually multiple. They show multinodularity, myxoid change, and express S100; however, they involve larger nerve trunks and are often associated with neurofibromatosis. In our case, the lesion was single and the patient did not have any stigmata of neurofibromatosis. Myxoid schwannomas show occasional foci of biphasic pattern with Antoni A areas and Verocay bodies. They lack multinodularity but express S100. Perineuriomas are composed of slender fibroblast-like cells in storiform, whorled, and fascicular pattern in a myxoid or collagenized stroma. They are EMA positive and S100 negative as opposed to our case. Neurothekeomas are benign, predominantly cutaneous tumors originating from the nerve sheath. Histologically, neurothekeomas are of three subtypes: myxoid, cellular, and intermediate. The most common type of intracranial neurothekeoma is myxoid. The myxoid variant is considered to be of a schwannian origin with the proliferation of the spindle, stellate, and epithelioid cells within a myxoid stroma. The cellular variant is of an unclear origin with a possible myofibroblastic or smooth muscle differentiation and a rare neural differentiation. The tumors with features of both cellular and myxoid type are classified as the intermediate type. On immunohistochemical staining, the tumor cells are positive for S100 antibody, GFAP, collagen type IV, CD34, nerve growth factor receptor (p75NGFR), and CD57. It has been reported in the literature that the tumor is not attached to the adjacent neurovascular structures, making it amenable to easy gross total resection with very less chances of developing a postoperative neurological deficit. Intracranial neurothekeoma, being a very rare tumor and due to scarcity of reported literature, still, many aspects of the disease regarding pathogenesis, natural history, treatment protocols, and outcome are unclear. Hence, contributing to literature in the form of case reports and case series is very valuable and will help us forming a treatment algorithm in the near future. Gallager RL, Helwig EB. Neurothekeoma – A benign cutaneous tumor of neural origin. Am J Clin Pathol 1980;74:759-64. Chow LT, Ma TK, Chow WH. Cellular neurothekeoma of the hypopharynx. Histopathology 1997;30:192-4. 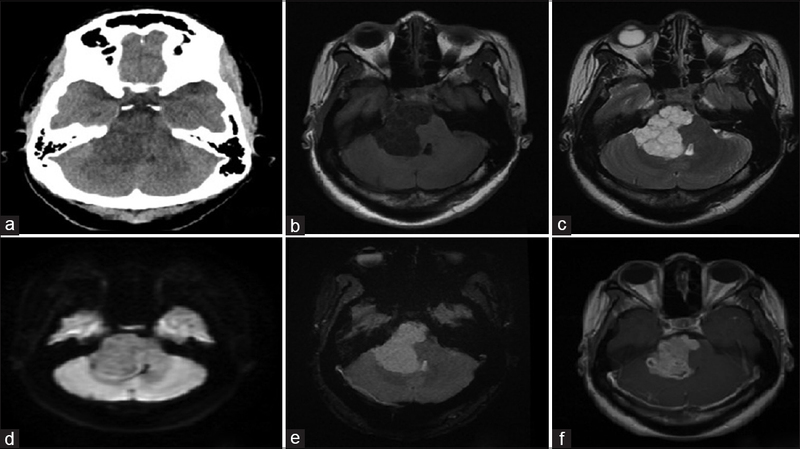 Vij M, Jaiswal S, Agrawal V, Jaiswal A, Behari S. Nerve sheath myxoma (neurothekeoma) of cerebellopontine angle: Case report of a rare tumor with brief review of literature. Turk Neurosurg 2013;23:113-6. Bulduk EB, Aslan A, Öcal Ö, Kaymaz AM. Neurothekeoma in the middle cranial fossa as a rare location: Case report and literature review. Neurochirurgie 2016;62:336-8. Alexandru D, Satyadev R, So W. Neurothekeoma in the posterior fossa: Case report and literature review. Perm J 2012;16:63-4.